string(1217) "Resource Centre > Uncategorized > Legitimate and Meaningful. Stakeholder Engagement in Human Rights Due Diligence – ICT"
This working paper was written by Dunstan Allison-Hope and Faris Natour at BSR, with additional guidance, perspectives, and insights from Jim Dempsey, Emma Llanso, and Emily Barabas at the Center for Democracy and Technology (CDT). It was commissioned and funded by Microsoft’s Technology and Human Rights Center, though all final content decisions were made by BSR. The purpose of this paper is to address the challenges faced by information and communications technology (ICT) companies seeking to apply Principle 18 of the UN Guiding Principles on Business and Human Rights (UNGPs) by integrating rights holder engagement into their human rights due diligence. In particular, this paper focuses on who companies should engage with and how they should engage, with an emphasis on specific human rights—privacy, security, and freedom of expression—where engagement with users of ICT is especially challenging. While engagement with other potentially impacted groups, such as employees and workers in the supply chain, is also important, this paper focuses on users of ICT products and services. 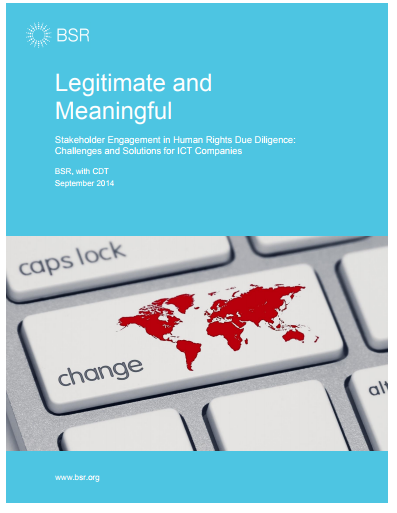 This working paper is particularly relevant for ICT companies undertaking human rights due diligence, third parties undertaking due diligence on behalf of companies, and stakeholders participating in said due diligence. Our premise is that meaningful engagement with rights holders needs to play a much greater role in human rights due diligence, and we set out approaches to achieve that goal.